Shanthis took a fresh step for caring our tooth in a natural way through 'Shanthis Husk Ash'. Our grandmothers and grandfathers had strong teeth for even in their 80s & 90s, but now even children have dental issues. So we started thinking of making a tooth powder that is pure natural. The main incredients used in the making of 'Shanthis Husk Ash' are clove, pepper, salt and husk ash. 'Shanthis Husk Ash' contains only pure veg incredients. 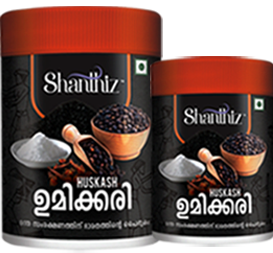 Clove, pepper, salt , husk ash are the main incredients used in the making of 'Shanthis Husk Ash'. According to Ayurvedic medicine, pepper is commonly used to treat conditions of tooth decay and toothache. Salt water temporarily increases the pH balance of your mouth, creating an alkaline environment in which bacteria struggle to survive. Cloves contains eugenol which is an antiseptic and anaesthetic. This works best for toothache and also wipes out number of germs. Husk ash is beneficial for the people who are suffering from bad breath, bleeding gums, lose teeth, discolored teeth, etc. © 2017 Shanthis Enterprises. All rights reserved.